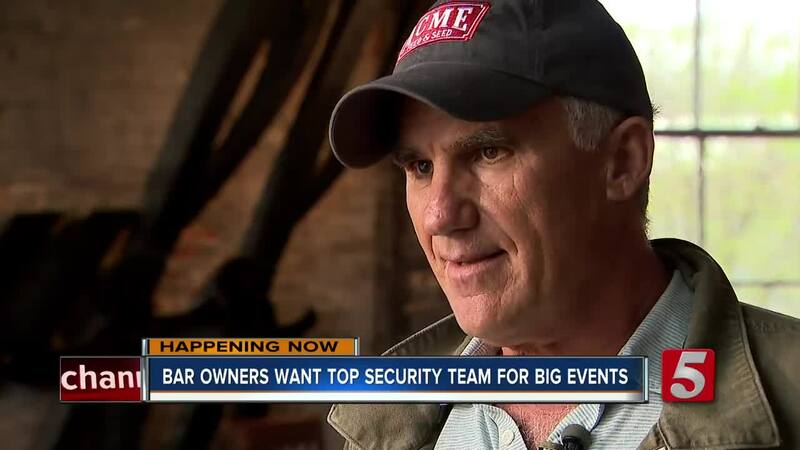 NASHVILLE, Tenn. (WTVF) — Safety is the number one priority for many restaurant or bar owners downtown during big events. April will bring plenty of revenue to Nashville with several events including the NFL draft and the Rock N Roll Nashville Marathon. In preparation for the safety of crowds, owners start by having the best security team. Acme Feed & Seed owner Tom Morales said his popular place is the number one ride share destination downtown. Whenever there's a big weekend, which is often, he said his security team is well trained to handle any situation. His company is trained by former Navy Seal members. "We've got a great group of ex-Navy Seals that come in and teach us how to deescalate situations. We realize it's preparation, training and being flexible to what's going on. We practice and open hand policy. We try to disarm a situation rather than escalate," Morales said. President and CEO of the Nashville Business Partnership Tom Turner works with the top 100 businesses in downtown Nashville. He said he wants anyone visiting to enjoy their time and be safe. “We present ourselves very well to visitors whether they're coming here to visit someone they know or they're here for business or they're here for fun. We present ourselves very well it is clean and safe city one of the reasons we have many bachelorette parties because it is clean and safe,” Turner said. Metro Police plan to hold a press conference closer to the NFL Draft weekend to talk about downtown security measures.